From humble beginnings in Hertfordshire, Maribou State found their musical niche in 2015 with their critically acclaimed debut album Portraits. 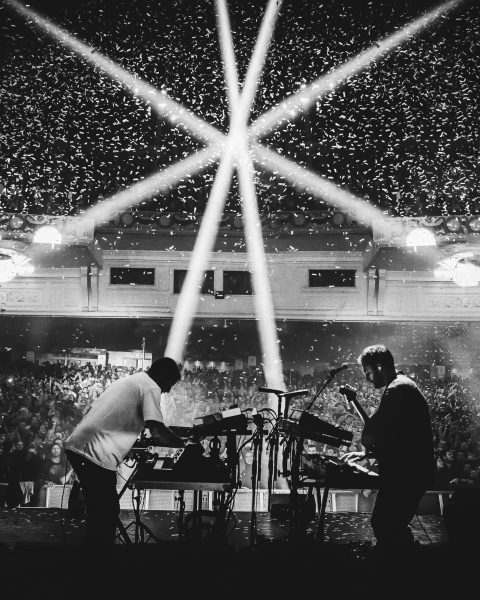 Now four years later, dance-music duo Chris Davids and Liam Ivory electrified Saturday night at Manchester’s Albert Hall on their sophomore album tour, Kingdoms in Colour. Maribou State were clearly still feeding off the buzz from playing London and Bristol just a few days prior, but still seemed stunned at the energy Manchester had to offer. The stage was set. Spotlights of blue and white bow their heads, illuminating the balconies, the back wall and finally the floor beneath them. In the gloomy glow the band takes their positions behind keyboards and guitars and drums as the crowd roars in anticipation. It would only seem fitting that they began with the very first song of their first album. The song “Home” is appropriately named: you feel acquainted with the sound. Yet woven into the song are distorted hums and moans to inflict feelings of unfamiliarity. Kingdoms in Colour features previous collaborators like Holly Walker in “Nervous Tics” and “Slow Heat” as well as U.S. group Khruangbin co-producing one of the album’s two singles “Feel Good”. Walker made her appearance for fan favourites like “Steal” and “Midas”. As she grooved from left to right on stage, smirking to the band as she did, it was clear that their relationship between her and them was more than professional: a bond strengthened by similar visions. The album is vastly more ambitious than its predecessor. After a Portraits world tour, Davids and Ivory scoured the globe for inspiration. Each song builds to a combination of unlikely instruments in what can only be described as some sort of neo-orchestra. “Nervous Tics” is quickly becoming a personal favourite of the album. It blends Walker’s falsetto with the Guzheng, an obscure Chinese instrument found on their worldly travels. Her voice becomes increasingly indistinguishable from the crescendo of melancholy drums. What is personally intriguing about Maribou State is that their music somehow suits a rainy Sunday afternoon as much as the depths of Saturday night. Across the crowd you could watch people losing themselves in the music, while others felt comfortable just bobbing their heads. Maribou State is music for whatever mood you’re in. Their sound is one that begs to be seen and heard live: the performance engages the eyes as much as the ears. Shoddy earphones whilst on a bus will not do the songs justice, but watching them on stage is a delight. They’re young, they’re cheeky, and they’re comfortable in the spotlight. It’s clear that the group sought to tell their story in their set-list. This is what we were, and this is where we are now. As a last hurrah, the band was cheered back on-stage with “Turnmills”, the second single off Kingdoms in Colour. The song is a slow build-up, but at its peak it’s a club banger and a wild send-off to end the night. Maribou State has this unique skill of making their music feel alive. Portraits was the same, but listening to Kingdoms in Colour, feels fresh and exciting while also embracing the technicolour empire of sound that made them famous.